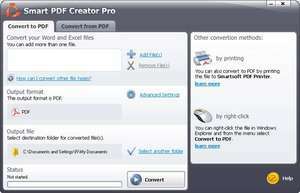 Smart PDF Converter Pro is one of those applications that was created because there's basically nothing else on the market with that particular name nor is there anything which really advertises what this program does in its main features. With that in mind, this program is nothing spectacular nor will the features it offers really surprise you, since a lot of other applications in this same category offer the same features with a better outcome. Though the uses of this program are pretty straight-forward, so is the user interface. It offers a quick and simple way to convert PDF files to other document types which you may send to colleagues or friends via email. Smart PDF Creator 14.4 is a shareware program and can be used as a demo to try the software until the free trial period has ended. A full version of the program is available after the trial period ends. For security reasons, you should also check out the Smart PDF Creator download at LO4D.com which includes virus and malware tests. Additional screenshots of this application download may be available, too. Smart PDF Creator has a presence on social networks.